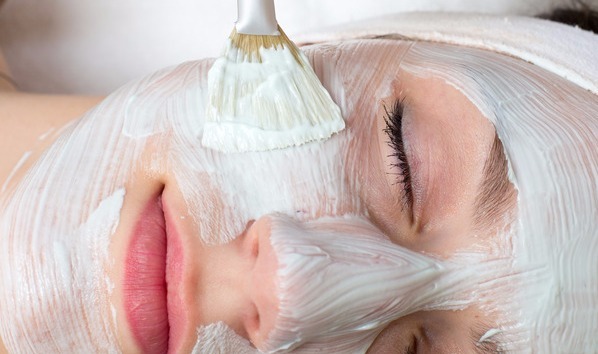 Enhance and smooth your skin tone and texture with a customized facial peel. * We will select the right peel for you, depending on your skin type and condition. We even have skin peels that are non-photosensitizing and safe to use during pregnancy. Keep your skin fresh all year round! 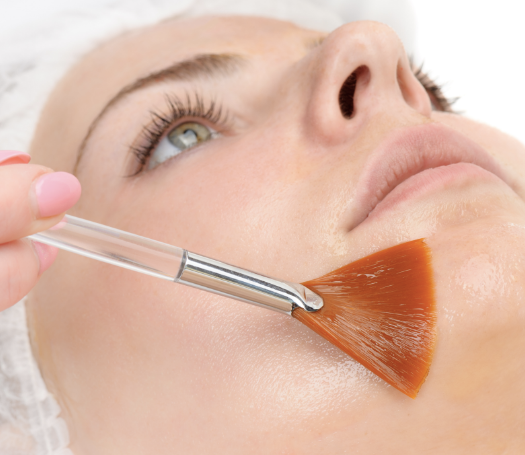 Chemical peels have been used for decades in medical cosmetology. Cleopatra first introduced her version of a chemical peel, bathing in sour milk (lactic acid) to produce smooth skin. While dermatologists pioneered skin peeling for therapeutic benefit beginning in 1882. Today we can synergize the knowledge of 100 years to produce highly effective and safe peeling by blending agents for maximum facial rejuvenation! Chemical peels, or facial peels, are an accelerated form of exfoliation, that is induced by a chemical agent which is applied to the skin to remove the damaged outer layers of the skin. We use highly effective combinations of alpha hydroxy acids (glycolic & lactic acid), beta hydroxy acids (salicylic acid), retinol, L-Ascorbic acid (Vitamin C) and amino acids to customize our peels, leaving your skin feeling fresh and healthy! Level 1 – superficial peeling (usually no visible exfoliation), 1-3 days of light exfoliation, little to no flaking. Level II – medium to moderate peeling, 2-4 days of light/medium exfoliation, light to moderate flaking. 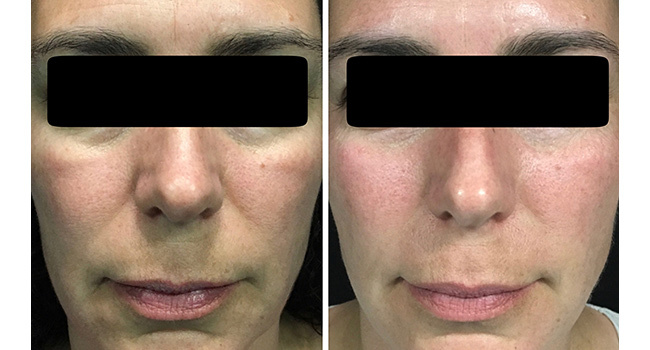 Level III – deep peeling, 3-5 days of aggressive peeling. Please note: Peels may not be suitable for all skin types. A skin consultation is required and a pre-peel treatment protocol may be necessary, as well as, a skin test spot. The perfect blend that totally refreshes the skin. Lightens, brightens and tightens skin in just one treatment! * Minimum 3 days of peeling can be expected with this skin peel. Skin indications: All levels of aging skin, pigment, melasma, oily/acne and scarring. This safe and outstanding resurfacing modality has a dual benefit. It reduces and treats all kinds of acne while resurfacing and smoothing the skin after just one treatment. Skin indications: acne/oily, aging skin, post microdermabrasion. A potent combination of AHAs , 27% L-Ascorbic acid (Vitamin C) & 4% Emblica evens the skin tone and greatly improves skin radiance after 1 peel. * Skin indications: All levels of aging skin, pigment, melasma. Simple & effective antioxidant skin rejuvenation. Skin indications: All levels of aging skin, pigment, melasma, rosacea, sensitive skin and safe for use during pregnancy. Find out more here. Download pre and post treatment instructions for chemical peels: here. A special chemical solution is applied to the skin, for a specified amount of time to initiate the removal of the outermost layer of skin or deeper skin layers. The time the solution is left on the skin varies between 2-15 minutes, depending on the type of peel, peel treatment number, and the skins’ response to the solution. Peels are not recommended for people with very sensitive skin, active cold sores, undiagnosed lesions, diabetes, auto-immune disorders, eczema, dermatitis, psoriasis or lupus. Peels can be applied to the entire face or individual areas that require treatment, such as sun damage or to control acne. * Other areas that can be treated are the neck and décolleté. How many peels I need? This is a variable and depends on your skin condition and skin type. All peels are customized to each individual, but all are managed using a step-up approach, which begins at the superficial layer with gradual increases to enable the skin to safely and effectively reach a Level 3 peel, if required. In general 4-8 peels are needed for optimum results, scheduled every 10-14 days or as required. * Please note: chemical peels are not effective for removal of medium or deep acne scars and will not clear skin from acne, if used as a stand-alone procedure. What other treatments can be done with a chemical peel? Effective combinations for skin rejuvenation and acne control include: microdermabrasion (micropeel), laser photofacials or laser genesis. Customized combination therapy can be discussed during your complimentary consultation. What should I expect during & after the treatment? Chemical peels are usually very gentle and create a temporary sensation of tingling (activity) or warm flushing to the skin during application. Your skin may be pink for several hours after a treatment and you may experience some tightening of the skin, which may last for several days. Typically you may return to work right after the peel. The amount of peeling, if any, varies from person to person. You may see light to medium flaking by two or three days after the treatment. Depending on the type of peel, flaking up may last up to five or six days, while some clients may experience very little peeling. Chemical Peels very in price depending on the type of peel and area being treated. A skin consultation is necessary to confirm pricing. Can be used as a stand-alone procedure or in combination with Dermaplaning, Microdermabrasion, or HydraFacial. Schedule your peels at Fresh Laser Skin Studio in NW Calgary today! You can book online or you can reach us phone at (403) 264-4494.